Wayne Maurice Caron was born on 2 November 1946 in Middleboro, MA. 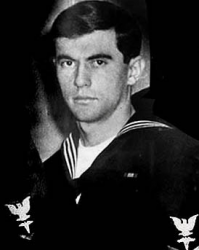 He was a Hospitalman Third Class in the U.S. Navy and was posthumously awarded the U.S. military's highest award for valor, the Medal of Honor, for his heroic actions in the Vietnam War. Caron joined the Navy from Boston, MA in 1966, and on 28 July 1968 was a Hospital Corpsman Third Class (E-4) serving as a combat medic attached to the Headquarters and Service Company, 3rd Battalion, 7th Marine Regiment (Kilo 3/7), 1st Marine Division (Reinforced), FMF. During a firefight on that day, in Quang Nam Province, Republic of Vietnam, Caron was repeatedly wounded while he moved between fallen Marines, rendering aid to each, but continued his rounds until being killed by enemy fire. 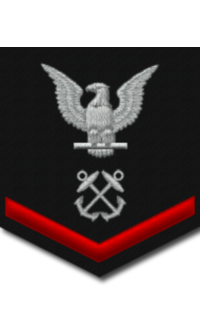 Citation: For conspicuous gallantry and intrepidity at the risk of his life above and beyond the call of duty while serving as platoon corpsman with Company K, during combat operations against enemy forces. While on a sweep through an open rice field HC3c. Caron's unit started receiving enemy small arms fire. Upon seeing 2 marine casualties fall, he immediately ran forward to render first aid, but found that they were dead. At this time, the platoon was taken under intense small-arms and automatic weapons fire, sustaining additional casualties. As he moved to the aid of his wounded comrades, HC3c. Caron was hit in the arm by enemy fire. Although knocked to the ground, he regained his feet and continued to the injured marines. He rendered medical assistance to the first marine he reached, who was grievously wounded, and undoubtedly was instrumental in saving the man's life. HC3c. Caron then ran toward the second wounded marine, but was again hit by enemy fire, this time in the leg. Nonetheless, he crawled the remaining distance and provided medical aid for this severely wounded man. HC3c. Caron started to make his way to yet another injured comrade, when he was again struck by enemy small-arms fire. Courageously and with unbelievable determination, HC3c. Caron continued his attempt to reach the third marine until he was killed by an enemy rocket round. His inspiring valor, steadfast determination and selfless dedication in the face of extreme danger, sustain and enhance the finest traditions of the U.S. Naval Service. In 1970, a plaque at the Chelsea Naval Hospital was placed in his honor. The name Wayne Caron is inscribed on Panel 50W - Line 22. Hospitalman Third Class Wayne Maurice Caron was killed in action on 28 July 1968. He is buried at Arlington National Cemetery, Arlington County, VA, in Section 51, Grave 2600.